Water is life: a now familiar phrase and declaration of an inalienable right. Survival of life depends on the water cycle which ebbs and flows from ocean to sky, sky to land, land to ocean. There is no beginning, no end. The water cycle cannot be escaped but the intensity can change and by extension life will change. 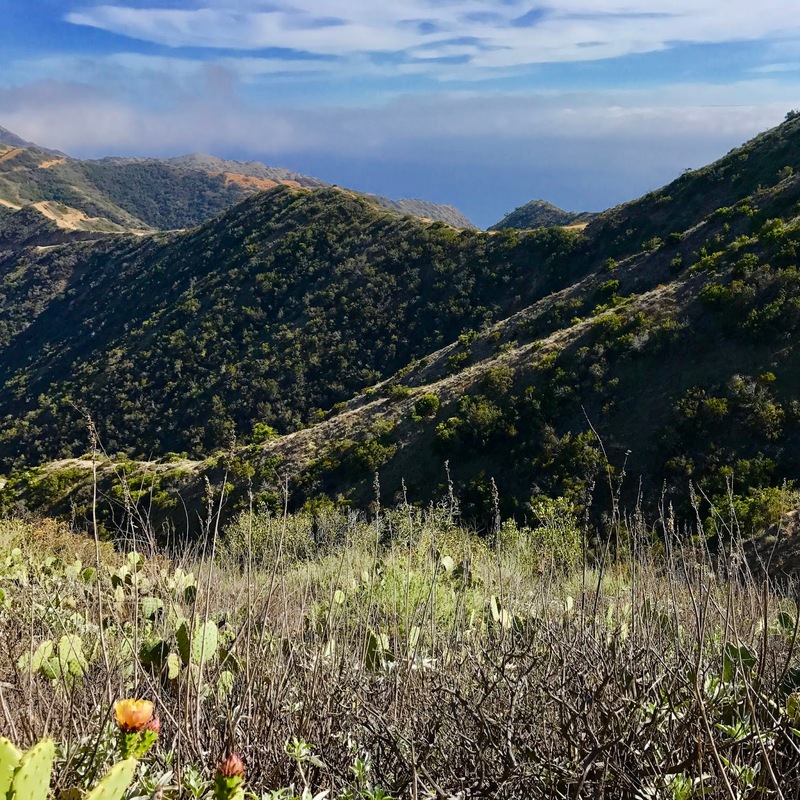 Catalina Island and many other regions in California are experiencing a drought which causes stress for plants, animals, and people. How do we adapt? what lessons can we learn? how do we take responsibility? 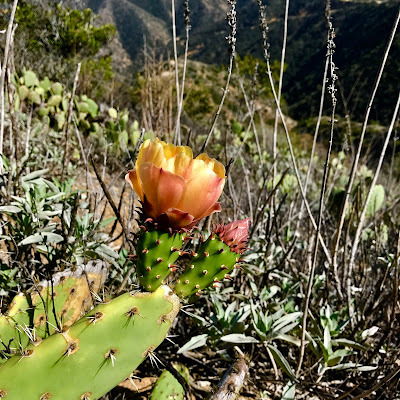 I pondered these questions and our course reading material while climbing a trail above the Nature Center at Avalon in search of a coastal prickly pear specimen (Opuntia littoralis). We had been assigned to choose a plant for field observation and I decided on this abundant, even weedy, cactus shrub. I would not settle on just any specimen though. I wanted one with a view. 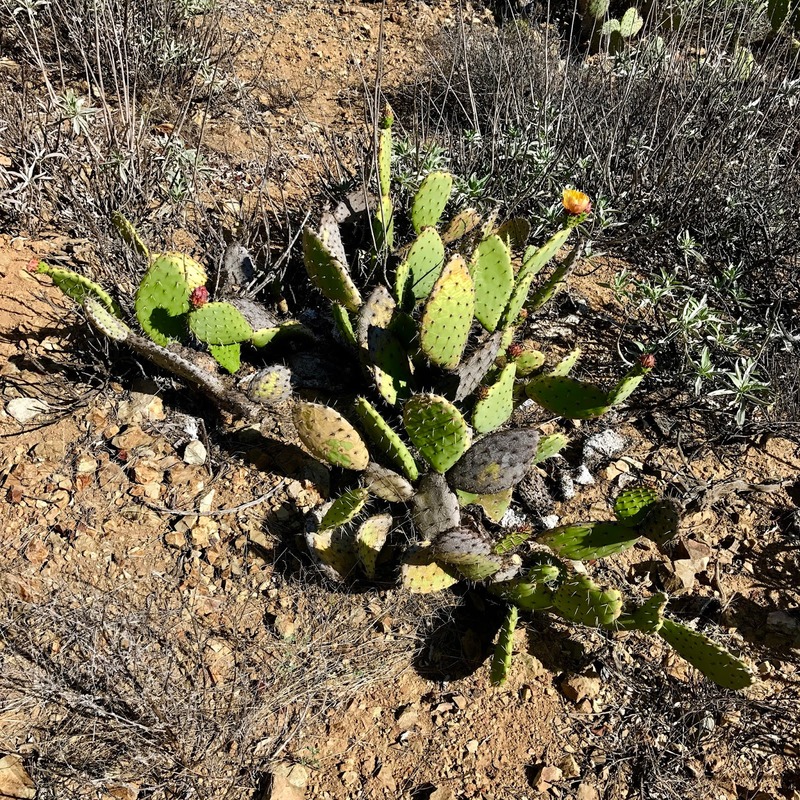 I found my plant only a few yards off-trail on a south-facing, rocky slope in bloom after the recent rains, surrounded by white sage (Salvia apiana), toyon (Heteromelas arbutifolia), and a sprinkling of what I learned later from a fellow classmate is silver clover (Acmispon argophyllus var. argenteus). 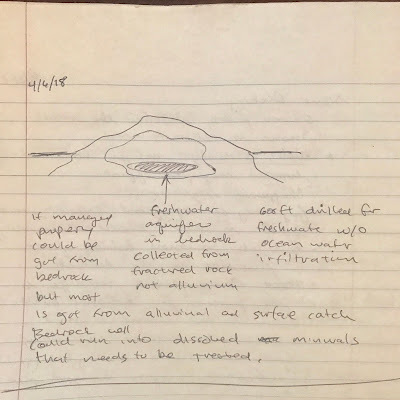 I opened my field notebook and began to follow the method of recording my observations as outlined by our instructor and the textbook. A gentle fog moving over the distant hilltops reminded me of the orographic effect I had read about on the ferry earlier. Water on the island is valuable in any amount, even if only by way of a modest coastal marine layer. 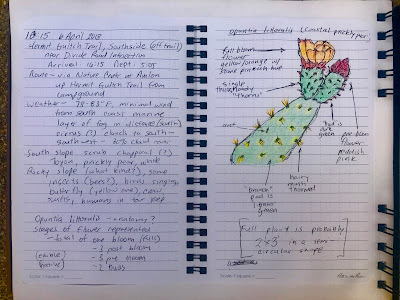 One reason I chose the coastal prickly pear is it seemed fun to draw. Oblong and oviate, this edible, fruiting cactus has beautiful yellow flowers with dull red bruises. My notes for the day mention three pre-bloom, one full-bloom, and three post-bloom flowers. 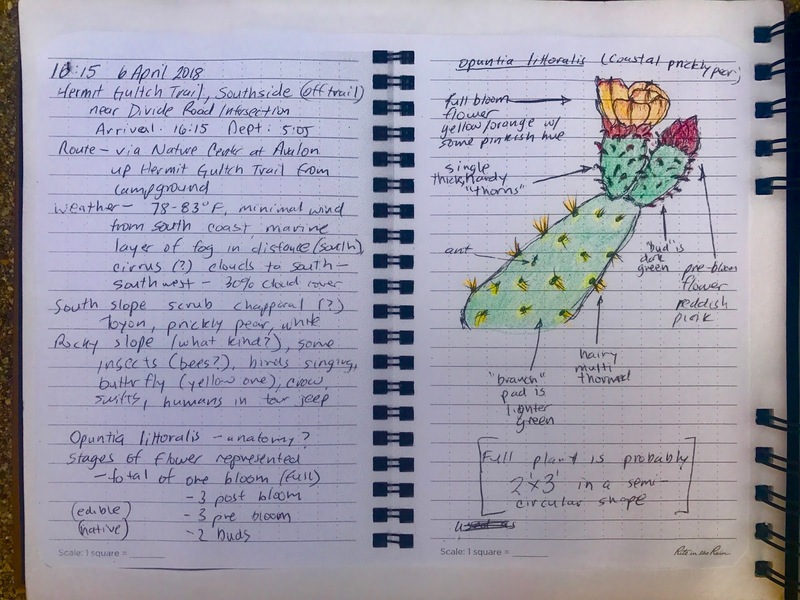 The full-bloom and a pre-bloom flower adjacent to one another captivated me and I chose to focus on them for my first drawing in my field notebook. In my naivete I struggled to name the parts of the plant. Branches? stems? pads? thorns? buds? I wrote "anatomy?" as a reminder to answer these questions. Later in my research I encountered the species Wikipedia page and found it to be flagged for a citation about the dull, red hue found in the flower. 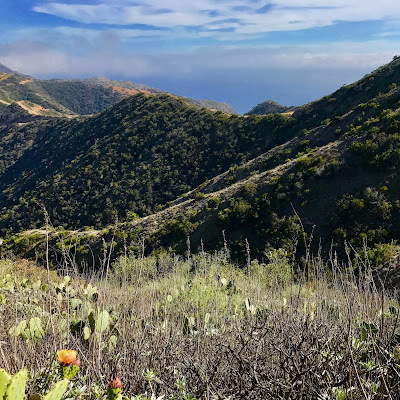 I sought a way to provide a good source for what I had observed and discovered the UC Berkeley Jepson Herbarium site which confirms the red color, plant anatomy, and a whole lot more. How does this plant survive a drought? We might say it is obviously adapted to dry weather, storing water in its fleshy branches and protecting itself with spines. We learned from our text and lectures about transpiration -- the process by which plants "breathe out" water vapor as part of photosynthesis. 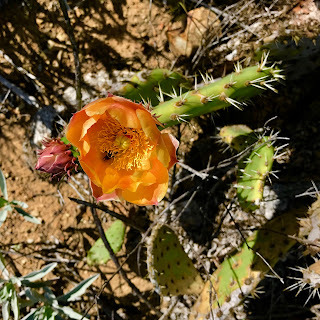 It turns out transpiration in Opuntia only occurs at night when they "breathe in" carbon dioxide, reducing the release of water vapor due to cooler temperatures and thereby retaining some water which might otherwise be lost during hot days. It reminds me of when people walk in a desert at night to avoid perspiration. I respect this unique adaptation of cacti and succulents as a kind of wisdom. Hydrology consultant Steve Dickey was the guest lecturer for our third week's class meeting. 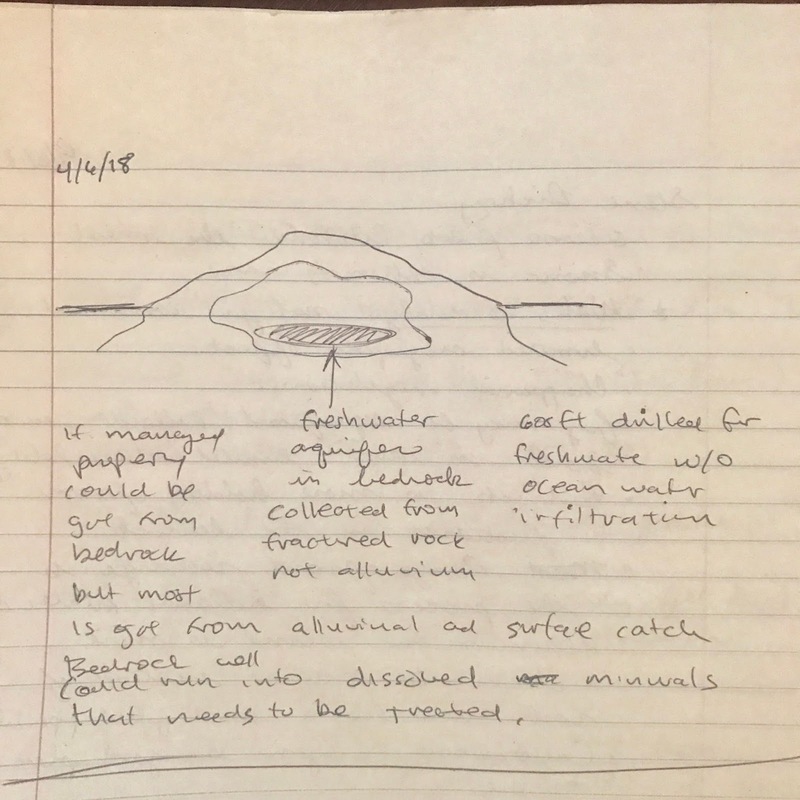 No stranger to the island, he discussed the unique characteristics of water on Catalina. 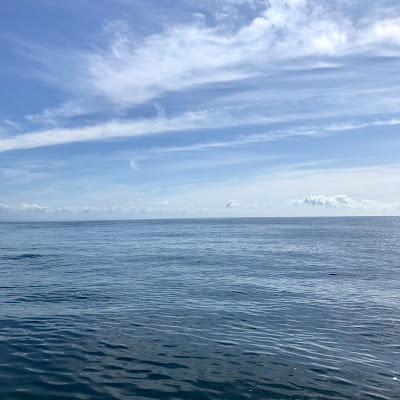 We learned that rainstorms on the ocean are the primary source of water for the island, the orographic effect negligible, and snow extremely rare. Alluviums do not provide much water as the soil is thin and most rainfall quickly drains to the sea. 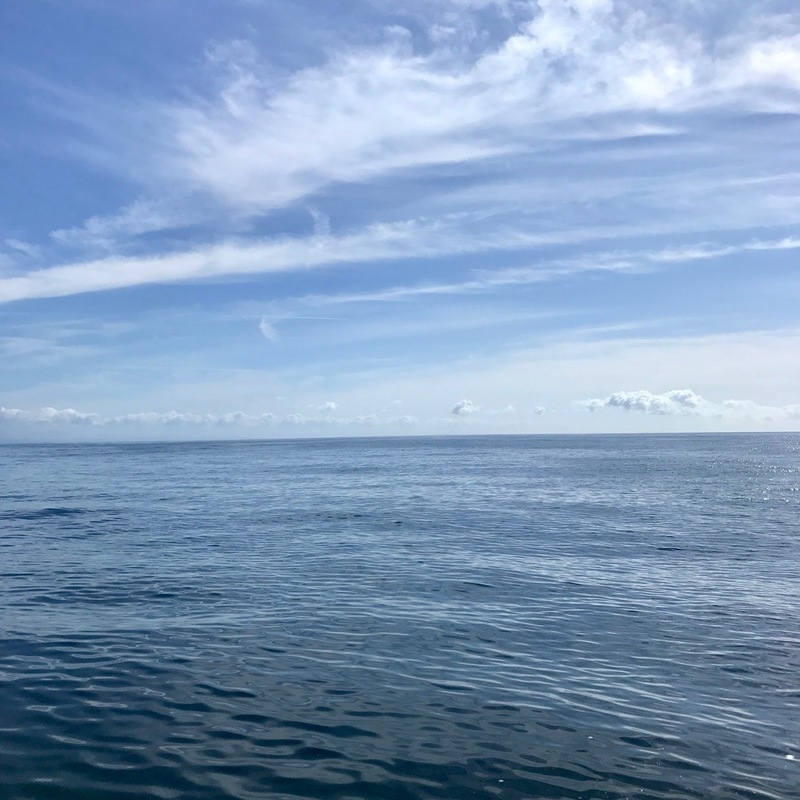 As an alternative to seawater desalination and reservoirs, Dickey posited bedrock wells. He explained that even very dense rocks like granite hold extricable groundwater (which may still may need treatment). A fellow student asked if such a thing is truly possible on Catalina to which Dickey responded yes, if properly managed. People have their ways of adapting to water scarcity too, exploring solutions we hope are filled with wisdom.